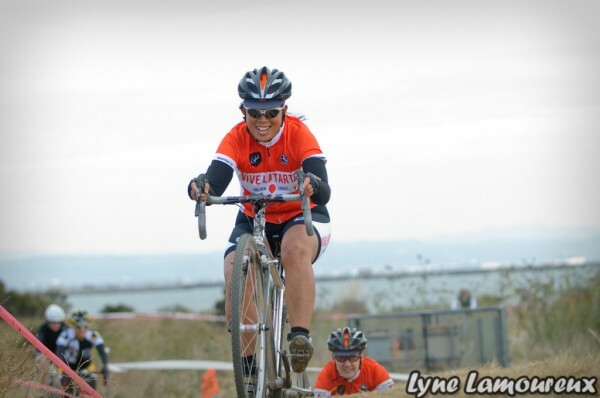 Today was second race of the Bay Area Super Prestige Series at Candlestick Park, and I was amazed I made it out there to race at all as this morning unfolded like a comedy of errors. Now that the CX season has begun, my old piriformis muscle injury has reared its ugly head again. It’s been telling me, “Oh, it’s that time of year again when you do unnatural things with your bicycle like jumping over barriers and running up hills. So here I am again, just wanted to let you know I’m back as well.” So I’m always stiff and achy when I first wake up and have to make sure I can do the basics like climb out of bed without my right side spasming out of control. I don’t know why I always look like I’m smiling when I’m racing. That’s really my suffer face. Perhaps my brain’s in denial?Photo by the lovely and talented Lyne Lamoureux. Then I proceeded to have breakfast; I opted for a bowl of oatmeal with peanut butter and trail mix on top. About 20 minutes later, I started to feel pretty nauseous. It turns out this allegedly healthy bag of dried fruits and nuts was actually a bearer of bad toxins. The Bearded One had been up all night due to food poisoning, and the thing he ate the most the evening before was this dastardly trail mix. But was this going to stop me from racing today? Hell no. I always feel like puking anyway during a race, so why not just start off feeling queasy beforehand? And after a few rounds of worshipping the porcelain god, I felt much better. At Candlestick, I assessed the course with my my fellow vive le tarte + Cykel teammate Bridget. We did a pre-ride, then warmed up on the road alongside the stadium with some sprints to get ready. Shortly before 1:30pm, Bridget and I headed to the start with the rest of the women’s fields: Elite, Masters and B’s. One great aspect of racing CX with local Bay Area women is that mostly everyone is friendly and there’s not too many aggros attitudes. We chat and make jokes at the start – which helps calm your pre-race jitters – and we all cheer when our friends get their call-ups. It’s nice and relaxed – at least for me – and I don’t freak out too much when the whistle blows and we’re all out of the gate. Anything I achieve beyond that is gravy. I set the bar of achievement pretty low because I race cyclocross for the wonderful camaraderie of my fellow racers, the cheers and heckles of the crowd and the super-cool community. While I put time on the bike to get ready, I don’t train seriously anymore since I got burned out on training when I was racing at our local track. This girl now just wants to have fun, and that means I’m no longer uber-vigilant about a training regimen. And there’s too many other things I want/need to do in my spare time. So I go out, ride in the pain cave for 45 minutes and hope for the best. I was stoked, however, that I didn’t yard sale on the steep, sketchy hill that led to a sharp right turn on pavement. One woman ran down it on the first lap – which made me wonder if its condition had changed for the worse since our pre-ride – but I descended it with no problems. But alas, on the second lap I lost my timing chip at the bottom of the hill and felt it slip off my ankle. I debated whether to stop and retrieve it, but decided to push onwards. At the tail end of my race, the leader and winner of the women’s Elite race, Helene Drumm, came roaring by on a mountain bike and lapped me close to the start/finish – but two out of three of my goals were achieved at least. I finished 12th and Bridget finished 7th overall. Then there was much rejoicing that we had survived another race and beer was had by all!